NLP has its own vocabulary. This NLP glossary can help you get to grips with some of the most important concepts and ideas. 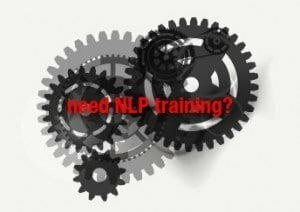 As discussed in What is NLP, NLP is the exploration of how we communicate, think and change with the aim of replicating and improving great performance in any context. This glossary gives you the building blocks that we use as part of that exploration. 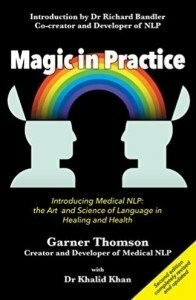 In addition, in the right hand margin we’ve included links to many NLP techniques, and what’s needed to use them effectively. The following books by NLP co-creator, Richard Bandler, are excellent for the latest NLP approaches and definitions, if you want to know more. (all links open in a new window). The sudden and violent release of repressed emotion. Subtle behaviour that will help both to trigger and to indicate which representational system a person is using to think with. Typical types of accessing cues include eye movements, voice tone, tempo, body posture and breathing patterns. The stage when you enter your client’s ‘model of the world’. Information presented in a continually variable form, rather than in discrete packages (c.f digital) The changing volume of speech is ‘analogue’ while the actual words are ‘digital’. A stimulus or trigger paired with a specific response. Anchors may be set deliberately or inadvertently, openly, or covertly. When two different anchors fire simultaneously, the end result is a mixed or neutral state. Neither anchor will remain intact. Related to hearing or the sense of hearing. Motivational pattern marked by avoidance of an unwanted experience, rather than by accomplishing a desired outcomes. The physical actions (and reactions) through which we interact with people and the environment around us. The ability to vary one’s own behaviour to elicit a response from another. Robert Dilts defined beliefs as: Closely held generalisations about (1) cause, (2) meaning, (3) boundaries in a) the world around us b) our behaviour c) our capabilities, and d) our identities. The ability to try out new beliefs for a short time to test their usefulness. Changing the thoughts, beliefs, behaviours and/or responses of a client without his or her consent. The process of learning to ‘read’ the unconscious, non verbal responses of others. Real or perceived casual relationship involving two or more events in time. Chunking laterally involves finding other examples at the same level of information. The ability to appear to be an effective palm reader, clairvoyant etc without any psychic ability. When all of a person’s internal beliefs, strategies and behaviours are fully in agreement and orientated to securing a desired outcome. Everything that is in current awareness. The ‘story’, including the ‘perceived’ cause, associated with a problem. The product of reflection, interrogation and psychoanalysis. A context is the framework surrounding a particular event. This framework will often determine how a particular experience or event is interpreted. The values or standards a person uses to make decisions and judgements It is useful to understand your own and other people’s criteria in both business and personal situations. The sensory maps (both conscious and unconscious) that people use to organise and guide their behaviour. Data presented in discrete packages, rather than in continuously variable form (c.f analogue). Words, for example are digital whereas the changing volume in which they are spoken is analogue. Is genuinely beneficial to yourself, to those closest to you and maybe mankind and the universe. A point in a strategy that allows the client to know when to stop the processing. The positive (or negative) anticipation of both coach and client regarding the outcome. The anticipation can effect the outcome. A method used to notate the structure of any particular experience. The concept of the four tuple maintains that any experience must be composed of some combination of the four primary representational systems – A,V,K,O where A = auditory, V = visual, K = kinesthetic and O = Olfactory and Gustatory. The process of mentally rehearsing oneself through some future situation in order to ensure that the desired behaviour will occur naturally and automatically. Construct of how a situation or event is perceived or the ‘rules’ behind any interaction. Can have a significant impact on what outcome is achieved. Thus changing the frame (reframing) can have a significant impact on the outcome. Relating to taste or the sense of taste. A method of focusing or changing some one’s attention, making them more or less ‘suggestible’ to external or internal commands and giving them greater access to their own resources. A way of leading people into a hypnotic state, often initialling focusing on what is true for them and leading them into useful hypnotic states. Facilitating the acquisition of a new strategy or behaviour. A new strategy may be installed through some combination of NLP skills or techniques and/or any combination thereof. Relating to body sensations. In NLP the term kinesthetic is used to encompass all kinds of feelings including tactile, visceral and emotional. Using two or more different techniques towards a given outcome to increase the likelihood of success. An altered and normally highly ‘aware’ state which is accessed by focusing on a word or rhythmic behaviour like breathing. Usually less directive than hypnosis. The idea that our experience of life is built up from our own unique mental maps based on our experience, values, beliefs etc. We are more likely to help others change and develop if we can work from their maps rather than impose our own on them. The meta model is a model developed by John Grinder and Richard Bandler that defines syntactic environments by which one can detect and challenge deletions, generalisations and distortions. Using questions from the Meta Model (albeit with care) can help raise our client’s unconscious strategies into consciousness and help them solves their own challenges without us having to make direct suggestions. A process by which one sorts through multiple generalisations simultaneously. As such, meta programs control how and when a person will engage any set of strategies in a given context. Stories, parables and analogies used in order to communicate a particular idea. Throughout history stories have been a very effective means to communicate ideas and stimulate change. A model developed by Richard Bandler and John Grinder through the hypnotic language patterns of Dr. Milton H. Erickson. The act of creating a calculus which describes a given system. NLP came and comes from modelling successful people. Modelling people that ‘aren’t successful yet’ in a specific context can also be useful as it may give the person ideas how to improve on their own, or ideas for what the coach needs to do next. From our point of view a model doesn’t need to be ‘true’ it just needs to work! Referring to our five senses, especially when describing how subjective experience is created. Verbs transformed into noun; a ‘process’ represented by a ‘thing’, inferring that it can’t be changed easily. For example: Communication is a nominalisation of the verb To Communicate. “Communication is awful at work” feels set in stone. “We need to communicate better at work” is full of possibility. Co-founded by Richard Bandler and John Grinder. There are many useful descriptions of NLP. Richard Bandler describes it as ‘The study of the structure of subjective experience and what can be calculated from that’. We like to describe it as an exploration of how we think, communicate and change. Whichever definition you choose, NLP involves a study of attitudes that lead to success, modelling great performance and distilling both of these into techniques which enable others to produce improved results in a given context. The ability of brain architecture to be changed by experience. A simple model developed by PPI Business NLP to apply NLP to coaching and consultancy. Goals or desired states that a person aspires to achieve. The key purpose of an outcome is to be big and motivational enough to set a direction. Extending processing ability and expanding experience by moving from one representational system to another. A method used by communicators to establish rapport by matching certain aspects of their behaviour to those of the person with whom they are communicating. A metaphoric description of programs and strategies of behaviour that may appear to function independently from the client. While we may use ‘parts’ as part of an intervention we’re particularly keen to ensure all ‘parts’ are integrated into a functioning whole. Similar in some ways to meditation, trance and hypnosis. Can also produce very positive results. Process words (like verbs, adverbs, and adjectives) describing a subject. Predicates are used to identify which representational system a person is using to process information. Setting in advance the boundary conditions of an experience or event. Can make a significant different to the outcome. The use of words covertly to trigger a specific psychological response from the listener. Giving a client a process or sequence of tasks with very little content. If the client fills in the missing content with what’s right for them and carries out the tasks, it will lead to somewhere useful to them. The presence of trust, harmony and cooperation in a relationship. Changing a negative response to an experience into a positive or neutral one by placing it into a different context or meaning. Opposite to the fight or flight response. Brought about by certain meditative and relaxation techniques which cause an increase in the functional relationship between the two hemispheres in the brain. Senses through which the brain receives information about the environment – e.g. visual, auditory, kinesthetic etc. Process of treating an abstraction as a concrete or material object. A state experienced during meditation characterised by reduced metabolic activity coupled with wakefulness. Where some seemingly negative or problematic behaviour carries out some positive function at some level. For example, smoking may help a person to relax or help them fit a particular self image. Construct aimed at orientating the subject towards solutions rather than avoiding problems. Seeking solutions rather than spending all the available time on analysing problems. Two or more different different responses set to be activated by the same stimulus. Most commonly, stacking is used to create a particular resource state. The process of overlapping between representational systems, characterised by phenomena like see-feel circuits, in which a person derives feelings from what they see. The total ongoing mental and physical condition from which a person is acting. A set of explicit mental and behavioral steps used to achieve a specific outcome. The special sensory qualities perceived by each of the five senses. For example, visual sub-modalities include colour, shape, movement, brightness, depth etc., auditory sub-modalities include volume, pitch, tempo etc., and kinesthetic sub-modalities include pressure, temperature, texture, location etc. An utterance without any deep structure background – or unconscious – information. The way in which a specific behaviour functions, as opposed to the reason it exists (content). The process of overlapping representational systems, characterized by phenomena like see-feel circuits, in which a person derives feelings from what they see, and hear-feel circuits, in which a person gets feelings from what they hear. Subjective construct which metaphorically organises your client’s past, present and future time. Subjective temporal experience that differs from ‘objective’ clock time. Developed by Miller, Galanter and Pibram, the term stands for the sequence Test-Operate-Test-Exit, which describes the basic feed-back loop used to guide all behavior. Useful in establishing strategies. Motivational pattern marked by seeking to accomplish or achieve a particular goal. A natural, altered state of consciousness, usually marked by reduced awareness of external events and increased focus on specific thoughts or feelings. Hypnosis is often described a way of using naturally occurring trance. Explanation advanced by the subject to explain behaviour induced by post-hypnotic suggestion. These often appear to be appear odd by unhypnotised observers – but may still be very useful. Behaviours usually associated with deep hypnosis (Amnesia, Arm Levitation, Hallucination etc). The act of locating through meaning(s) which may not be explicit in a surface structure. Connecting the meaning of one representation to the same meaning in another representation. Everything that is outside conscious awareness. Altered or hypnotic state in which the client maintains contact with outside world. A label that indicates what’s important to a client. What has to happen in sensory experience for a value to be met. Relating to sight or sense of sight. Testable in experience – sensory based. We suggest a further step – 5. What is the smallest action that will get you started. Telephone +44 (0) 1908 506563 with your name, how to reach you, and the reason for the call.